Thank you Rehab Management Magazine for the review! Whether your disability is short term, like a broken bone, rehabbing your way back from a stroke or something more permanent – we hope our adaptive wear product can help! 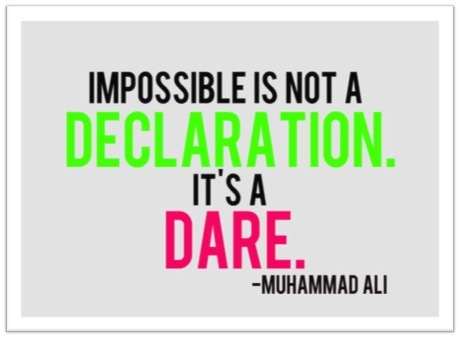 Muhammad Ali – Impossible is a DARE! We are headed in to the fourth quarter (football pun intend) of 4th grade. Hand in the air with the traditional four finger- last effort sprint – salute. When the year kicked off, the phrase “Toto we are not in Kansas anymore” was referenced. We just seemed to be entering into a whole new world. Homework, which use to be completed on the drive home, now was taking a much larger effort- to be exact hours- sitting at a desk- immediately as we entered the house. Snack served and sometimes she was there so long, snack rolled into dinner. My youngest likes to pretend she has the same requirements from her pre-school teacher. So to keep Hadley occupied for this new extended period was just as big of a challenge. Often I heard, Mom whats 2+2 = followed by an older voice asking what the exponent of x² + x² is. Then, the first big assignment of the year, a oral book report on a historical figure, with the exclusion of sports figures. They would take on their selected, teacher approved figure dressed in full character. Endless options- so many to choose from. Libby and I started brainstorming. She was looking for someone fashion related- “too easy” I said- it wouldn’t stretch her boundaries. A past president I suggest- “too boring”- a factual history buff she is not. She rattled off who her friends had already selected- Walt Disney, Johnny Appleseed, Harriet Tubman, Neil Armstrong. All with great teachable lessons to learn. Thought ensued as I went to bed that evening. 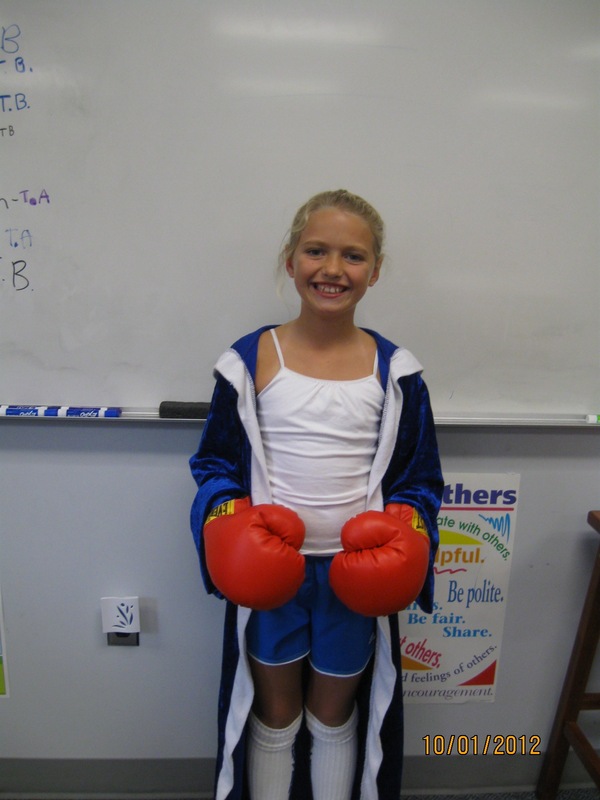 I shot an email to her teacher- in short it read….. Mrs. Adcock- I would like Libby to learn more about Muhammad Ali and present him for her book report. I know that sports figures are not permitted but because he suffers from the challenges of Parkinson’s disease, like her father, I would really like her to learn about the man before the disease. In true Mrs Adcock fashion, she enthusiastically agreed and we went to work. At first Libby wasn’t thrilled with the life lesson I was imposing on her but soon after she watched a few videos and read a book – she was enjoying it. Her book report was finished without any fights! As a family we watched countless hours of interviews of Muhammad Ali – pre and post Parkinson’s days. She even had Mrs Adcock cue one to the smart board during her report. She was happy with the end result, as was I. In the process of this report, I too was inspired about the man before the disease. We found the following quote about things being impossible. I printed it out on the heaviest weight paper I had and stared at it for days on my design boards. Each glance, concentrating on a different word. All seemed appropriate at different times. As the final details of MagnaReady needed to be decided, I choose this quote to be inserted in every package that we send out. On the front is his saying and the back is our care instruction. A detail that is a declaration. Here’s to the dare. If my 10 year old can dare to break out of her comfort zone and do a report to help educate her class not only on a story of a man but the disease he battles, and my husband can stand tall everyday while he faces the double dare this disease throws at him, then certainly, I can do my part and dare to reinvent a solution to a problem for so many. Make life easier when it’s not. Dare to make a difference. Dare to stand proud as a family. Dare to declare we choose to live our lives without the word impossible. http://www.wncn.com/story/21777005/a-dress-shirt-helps-people-with-limited-movement TV debut of MagnaReady – Stress Free Shirting – Adaptive Wear. Thank you Eileen Park for helping spread the word about Stress Free Shirting! This is a big week in the Horton house! Our oldest child turned 10! Landmark of double digits! We officially have a “tenager” in our midsts. As per usual, she asked probing questions of the day she was born- what time EXACTLY? what did we do the night before? when did she crawl? did she cry a lot? what were her first words? when did she get her first tooth? and do we still have the clothes she wore home from the hospital? Somehow, I do remember most of the details without consulting her Bible – aka baby book. We peruse a few photo albums where we thought it necessary to document every expression. But there’s one photo that has always catapulted to the top of my list of favorites. It’s a simple giclee black and white picture of just Libby and I. Her side profile precious. Her curly locks of hair naturally flowing, with a bow of course and an innocent loving smile on her face. It resides on my neatly cluttered desk. I often look at it and instantaneously I have a grin on my face. It seems even more appropriate to me this week, as we launch MagnaReady on a larger scale. I can’t help but draw inspiration from this photo. It’s just a mother and daughter sharing a tender moment and doing something we all take for granted – buttoning. Something so insignificant to most of us, that is until you or your loved one are unable to do it on their own. So here’s to 10! Here’s to MagnaReady! and here’s to the beginning of independence!